Rosalia Dolce first appears in Painesville, Lake County, Ohio, about 1898. In America, Rosalia Dolce was known as Rosalia Nasca, then, after she re-married, Rosalia Taravella. Rosalia Dolce, daughter of Giuseppe Dolce, was born on Wednesday, May 12, 1858, at Montemaggiore Belsito, Sicily. Rosalia married Vincenzo Nasca about 1881, at Sicily. After the death of her husband, Vincenzo Nasca, Rosalia married second, Illuminato Taravella, son of Rosario and Iganzia Taravella, on January 24, 1903, at St. Mary Catholic Church, Painesville, Lake County, Ohio. 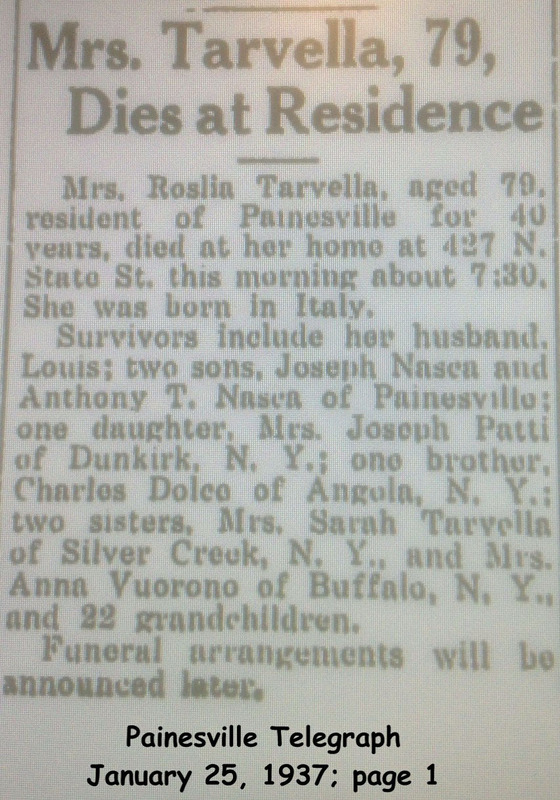 Rosalia died on January 25, 1937, at 427 North State Street, Painesville, Lake County, Ohio, at age 78. Her body was interred at St. Mary Cemetery at Painesville Township, Lake County, Ohio. Rosalia Dolce immigrated to the United States from Italy in 1894. She probably immigrated with her children, Margaret Nasca and Giuseppe Nasca. She probably was joining her husband, Vincenzo Nasca, in Buffalo, New York. The earliest record of Rosalia Nasca living in Painesville, Ohio, is her 1903 marriage record to Illuminato Taravella. However, a tombstone for a Vincenzo Nasca is at St. Mary Cemetery, Painesville Township, dated 1899. I assume Vincenzo was living in Painesville at the time of his death. I also assume that Rosalia Dolce Nasca is his widow. 1. Margaret Nasca was born about 1885, at Italy. Margaret married Giuseppe Patti. 2. Giuseppe Nasca was born on Friday, January 7, 1887, at Montemaggiore Belsito, Sicily. Giuseppe married Rosaria Panzarella, daughter of Vincenzo Panzarella and Santina Taravella, about 1912. Giuseppe died on November 20, 1964, at Lake County Memorial Hospital, Painesville, Lake County, Ohio, at age 77. His body was interred at Riverside Cemetery at Painesville, Lake County, Ohio. 3. Anthony P. Nasca was born on Thursday, May 3, 1894, at Buffalo, Erie County, New York. Anthony married Grace Wilder about 1921. Anthony died on November 28, 1963, at Lake County Memorial Hospital, Painesville, Lake County, Ohio, at age 69. His body was interred at Riverside Cemetery at Painesville, Lake County, Ohio. 4. Carmella Nasca was born on Friday, February 5, 1897, at Buffalo, Erie County, New York. Carmella married Giovanni Dolce, son of Serafino Dolce and Anna Nicosia, on January 18, 1919, at St. Mary Catholic Church, Painesville, Lake County, Ohio. Carmella died on December 10, 1924, at her home, Sanford Street, Painesville, Lake County, Ohio, at age 27, of breast cancer. Her body was interred at St. Mary Cemetery at Painesville Township, Lake County, Ohio. There were no known children of Rosalia Dolce and Illuminato Taravella.